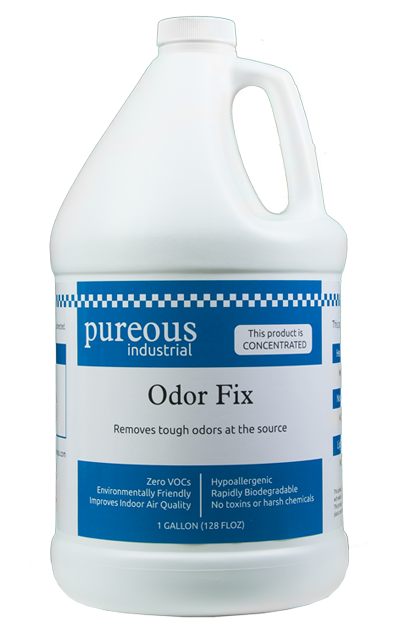 PureousTM Odor Fix is a revolutionary new product that works by acting as a desiccant to control pathogens and eliminates odors originating from harmful pathogens on a molecular level. It bonds to the contaminant to remove and eliminate strong odors without any harsh chemicals or toxins. There is no exposure to people or animals to toxins, harsh chemicals. This product is not like traditional odor products that are sprayed into the air to mask odor. 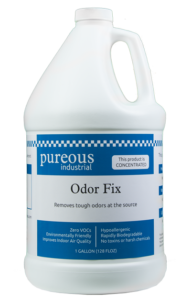 PureousTM Odor Fix is sprayed or wiped onto the source of the odor such as the wall of a dumpster, the grass in a pet area or directly onto concrete floors. It attacks the source of the odor and eliminates it, without using harmful fragrances, other toxins, harsh chemicals, allergens or volatile organic compounds. PureousTM Products are environmental, animal and people friendly. They contain none of the toxins, harsh chemicals, fragrances, dyes, allergens, or volatile organic compounds found in many traditional cleaning and odor products. This product also removes toxins and harsh chemicals that can build up over time, improving indoor air quality and making the environment healthier every time you use PureousTM.